Designed by an R/C modeler named LaMar Steen in 1970, the full-scale Skybolt became the most successful a two-place homebuilt fully aerobatic biplane in the world. Over 450 Skybolts have been built and flown in the US, and another 200 or so in 29 other countries. It is larger and easier to handle than smaller biplanes, yet is capable of unlimited aerobatics. The Skybolt is a straightforward, honest, and absolutely beautiful biplane. Seagull Models has created an outstanding 15cc size version of the Skybolt. It inherits the same classic good looks and great flight performance of the full-scale Skybolt. Difficult free-style gyrations and the full slate of aerobatic maneuvers are routine for this R/C model. The airframe is conventionally built using balsa and plywood, yet the laser-cut design allows the airplane to be kept light. The UltraCote covering and beautifully molded and painted fiberglass cowl and wheel pants add to its sleek appearance. 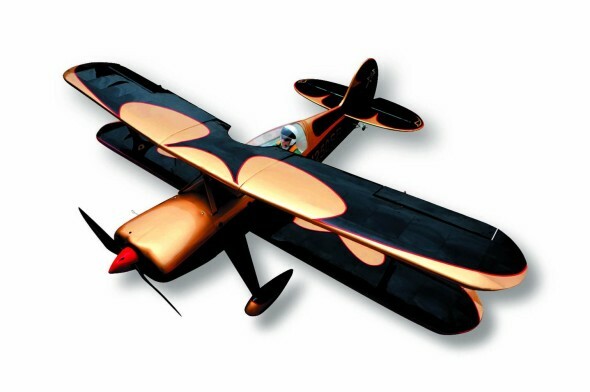 The Seagull Skybolt is the perfect airplane for everyday sport aerobatic flying and flight demonstrations.